While each child is unique, the majority tend to take their very first steps between the ages of nine and eighteen months. It’s a beautiful, magical moment witnessing baby’s first steps, but it also signals another milestone parents now face – choosing their first pair of shoes. It’s best to wait until the toddler years until you buy baby’s first pair of shoes. This is because while they are still new to walking, barefoot is definitely the best option for baby. They can use their toes for grip, and walking barefoot also gives the feet a maximum workout. So, don’t be too keen to rush out and buy a pair of shoes the minute your baby starts walking! It may sound like a simple enough task, but buying your toddler’s first pair of shoes can actually be quite tricky. There are many factors you need to take into account to ensure your little one doesn’t end up with ill-fitting shoes. 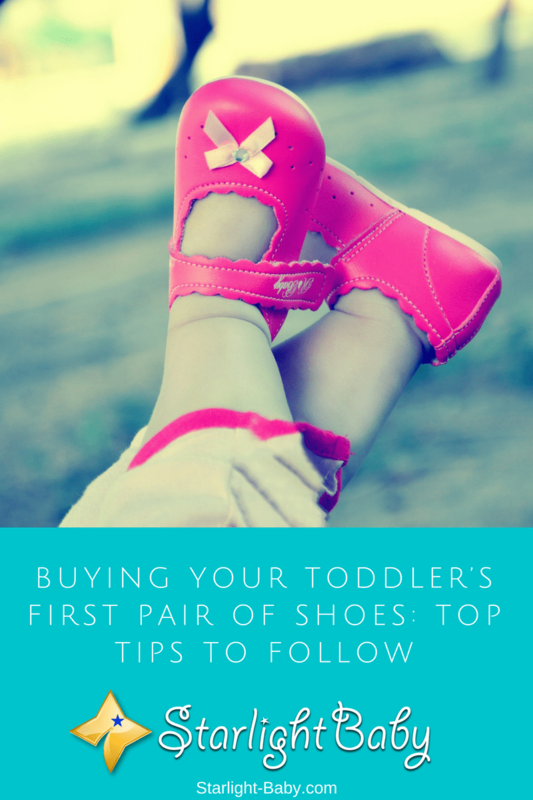 So, to help, below you’ll discover the top tips you should follow to ensure you’re choosing the right shoes for your toddler. It’s tempting to get online and order your toddler’s first pair of shoes, after all, the internet is the first place most people turn to for their shopping needs. However, it’s important to head to an actual shoe store to get your little one’s feet measured first. The staff at the store will be able to give you precise measurements and ensure you end up buying the best-fitting pair of shoes for your little one. Of course, you can always just use their measuring services and then buy the shoes online once you know which size to opt for. Even if you do know the measurements, however, shopping online for toddler’s first pair of shoes can be risky. As you likely know, the sizes for clothes and shoes can vary a LOT from brand to brand. So, the only way to really know if the shoes will fit your toddler is by trying them on at a shoe store. It’s also important to note here that both feet should be measured. This is because there can be quite a significant difference in the size of each foot. If there is quite a large difference, it’s a good idea to opt for the larger, rather than the smaller size. Just like babies, toddlers can grow at a pretty alarming rate. This means, their first pair of shoes isn’t likely to last very long. One of the main things to look out for is ensuring the shoes provide plenty of room for growth. Obviously, you don’t want them to be too loose, but you definitely want to make sure the shoes aren’t too tight. This can lead to all kinds of problems, including ingrowing toenails. Just ensure the toes aren’t right at the edge of the shoes and you can fit your finger down the sides. If you follow tip #1, you’ll find the staff at the shoe store will usually check the shoes aren’t too tight, saving you a job. It’s recommended your toddler’s feet should be measured every eight months or so at most to ensure they haven’t outgrown the shoes. When your toddler is trying on the shoes, they should ideally be wearing socks. That’s because unless you plan to leave them barefoot when they wear the shoes, you need to make sure the socks comfortably fit into the shoes, too. It’s surprising how much space socks can take up, so always make sure your toddler is wearing the same thickness of socks they will likely be wearing with the shoes most often. It’s easy to forget to check the soles of the shoes, but they’re equally as important as the design and fit of the shoe itself. You’ll want to make sure the sole is flexible and lightweight. This will aid in your toddler’s walking development. Also, look at the quality of the sole because if they’re made from cheaper materials, they’ll wear away quickly and become quite uncomfortable for your little one. You may be tempted to opt for the latest toddler shoe trend, but you need to consider whether it’s actually practical to do so. The shoes should be comfortable more than they are stylish. After all, you’re going to need to change them soon enough so it wouldn’t make sense to invest in expensive designer shoes. Similarly, clogs, pointy boots and fashionable toddler shoes may look cute, but they can be really difficult for your little one to walk in. Remember, they’re still getting used to walking by themselves so the last thing they need are shoes which make it even more challenging. When it comes to the fastenings on the shoes, Velcro is definitely easier. It becomes really difficult to get toddlers ready to leave the house, but Velcro shoes can really help speed up the process. They’re quick and simple to both put on and take off. The only thing you need to be wary of is your toddler could work out how to take them off by themselves. However, this shouldn’t be too much of a concern for their first pair of shoes as by the time they’ve figured out how to take them off, they’ll have outgrown them anyway. If you are concerned, choose lace-up shoes, but make sure the laces are long enough to be tied in a double knot. That way, there’s no risk the laces will come undone and cause a potential tripping hazard. One thing many parents don’t realize is a toddler’s feet swells up later on in the day. This means, if you go shopping for shoes in the morning, they may not give an accurate representation of how they’ll fit later on in the day. Considering how quickly toddlers grow, it’s often better for shoes to be be slightly loose rather than too tight. Overall, there’s a lot to consider when buying your toddler their first pair of shoes, but the above are some of the most important factors to focus on. It is recommended you take them to a specialized children’s footwear store to get their feet properly measured to ensure you’re buying the right size. What you have given here is some excellent advice for parents. I find many are all too anxious to put a child into shoes too young and so often fashion seems to overide good fit. These early years are so very important and set the way for a lifetime, Thank you for this informative blog. You’re right, Jacky. Some parents go for fashionable or flashy shoes instead of comfortable ones. This is definitely not good for the baby — it would make walking difficult instead of helping the baby develop his/her walking ability. New parents should learn from these tips and remember to prioritize what’s good for the baby, not what’s good for the eyes of other people. Every parent in this planet wants their babies to be the most beautiful. That is why they love to shop dress, accessories and shoes for their babies. Parents are excited to buy their baby’s first shoes, specially when their babies are still in the process of learning how to walk. Glad to know you’re already stacking up on great parenting tips. A guy who does that is definitely a future great dad! The biggest challenge I had while buying shoes for my toddler was her size. “Baby” shoes are most often found with soft soles as they’re not really made to support walking. However my daughter was quite small and walking quite early and the combination left me without a lot of options. They just don’t make real walking shoes for children that small. Taking her to real shoe stores, shopping online and buying and returning over and over, baby stores… when I did find shoes she had to be double-socked to fit and I had to forego rubber boots until she grew. It’s so hard, as a parent, to predict every obstacle you’re going to face with your little ones. This article is great for preparing you for another one of those unforeseen hurdles! That was a real tough challenge, LesMama. It’s truly frustrating if you can’t find a pair of shoes that would fit and is also comfortable. And you’re right, they don’t make shoes that are extra small, everything is of standard size. If there is a shop that customizes shoes, that would be a great option, isn’t it? Wow! I’ve never thought of it this way. This is an incredibly good piece of information to share with a lot parents especially folks who are new at it. I live in a compound with two of my brothers who are married. The first just had a kid about 10months ago. That kid must have started wearing shoes since like 6 months old. The mum finds joy in buying all sort of things for the baby including dozen of shoes. Am definitely going to be showing her this article once am done commenting. Lovely piece of information. It’s really thoughtful of you to share this article with your sister-in-law. I hope she will find this article helpful, too! Thank you for sharing this, Rumu. Wow! I thank goodness that I joined your list for it has afforded me the opportunity to learn new things about baby life that I’m much comfortable, even as a man, that my future kids are going to get the best parental care from me as regards their development. I took my time to read through all the 7 key points you listed out on the article and I must say that I learnt so much from it. It may surprise you that I still got the shoe I wore as a one-year-old boy then in my house. I had to pick it up from my mom’s place and kept it for my first son. I just hope it is going to fit him. On the tips you gave, I must say that going to the actual babies store is one of the basics while shopping for a baby shoe for it is there that one can get to check the size and whether it fits the baby without any discomfort. Other tips such as making sure to buy a shoe that gives the baby freedom, ensuring the baby wears socks with the shoe, buying shoes that have light sole and making the purchases at the later part of the day to ensure that you get the actual foot size of the baby are ones that I won’t forget in a hurry. Parents like me are very meticulous when it comes to the needs of my kids. I usually go for comfort and practicality. Toddlers feet grow very fast and a few weeks use would mean another pair of shoes coz the old one’s won’t fit anymore. All 7 tips are really very helpful what I missed among the 7 is the last one which I seldom care. Until now never thought that toddler’s feet swells up later on in the day. So you really have to consider shopping later in the day or else it would be very uncomfortable for the toddler and I guess not so much mothers know this too with this type of forum it makes me realize to read more even if you think you know what to do already. Because at the end of the day its not what you think it is but its how your toddler would feel with his/her new pair of shoes. You’re right, jojo, not many mothers know that the feet swell in the afternoon. I didn’t know it either until I’ve read this. We really learn new things everyday. You’re right to buy shoes ‘for comfort and practicality’. I also believe that’s the primary consideration when buying shoes for babies, because they really grow fast and the next thing you know, they’ve outgrown their shoes and you need to buy a bigger pair. Exactly! These forums definitely give me some ideas the next time around. This post is really helpful especially for first time moms. It is not unusual for parents to go for flashy or cool looking shoes for their toddlers that they tend to forget about these important things to consider. Learning your kid’s actual shoe size from a store was quite new to me since I have seen many parents just measuring it themselves. Now, I realized that this actually really makes sense. Choosing the wrong shoe size for your toddler could lead to big problems. I knew that wearing socks for them is really important too, but for soles being flexible and lightweight to help for their walking development is another new thing I learned. I am not a mom yet but learning these 7 steps before I become one would surely help me out someday. I’ll share these tips though to my friend who just became a mom. Good of you to be learning now, SirenOnFire. You’re on the right track. It is always best to learn beforehand because it makes you ready, and not have a lot of hits and misses. Being a parent is not easy but if you know what to do, it would ease some of the stress and hassle. Ah, the first few times that we went and bought our boy new shoes were not fun at all, haha. He wanted only specific ones that I knew wouldn’t be comfortable – they just looked nice and he liked the images that they had on them. It took me half an hour to explain to him why we won’t buy those shoes. Now I feel like he’s starting to understand a bit more and he listens to my advice. We try to compromise and get shoes that are comfortable but also aren’t bad looking. I want him to feel good wearing them and not like he “must” wear them. Buying anything new for a toddler can be stressful so your tips are always useful for any parent, new or old. It’s really important to explain things to toddlers. They are already able to understand things if explained in a way they can comprehend. And like what you did, you also allowed him to decide on what he wants, and you compromised. This makes them feel they have control over the situation. It does seem you’re really excited for the coming baby — you’ve bought four pairs already! Wow! She is one lucky child to have a generous aunt like you. I hope the shoes are all comfortable. And thank you for sharing this article with your friends. We always appreciate efforts to spread the news and keep parents informed and aware. Helpful tips great jobs! When buying shoes I always consider the comfort of my baby. I usually bought lightweight shoes I don’t care if it is expensive considering that toddlers love running around. It should be perfectly fit and comfortable to avoid a possible accident. Though it mentioned here that barefoot is the best option for baby to use for their toes for grip, and gives feet workout and yes I totally agree with this but sometimes I don’t want to get his feet dirty and I’m afraid he might get wound in case he steps on a sharp object. Indeed, comfort should be the primary consideration when buying baby shoes. Comfortable shoes are important in a baby’s walking development. The same thing is true with adults — we buy shoes based on how comfortable they are on our feet. Who would want to end up with really sore feet? I really liked the tips which you mentioned for choosing the baby shoes. However, in addition to these we are also pretty careful about the fabric as our toddler has sensitive skin. We try to avoid the shoes which can cause any kind of rashes. In addition to the inner sole, we also look at the type of stitching used specially on the backside of the inner part of the shoe. Moreover, we rarely allow our toddler to wear the shoes for a period of time which is greater than 3 hours. This ensures that we are able to avoid rashes as well. Thank you. Your advice will really help a lot of parents, especially new ones. Kids grow fast so for toddlers, it’s recommended that they have their foot size measured every two or three months. And because kids at this age tend to quickly outgrow their shoes, it might not be wise to buy excessively pricey shoes that will probably only wear for a few months. Comfort and fit should be the parents’ priority.